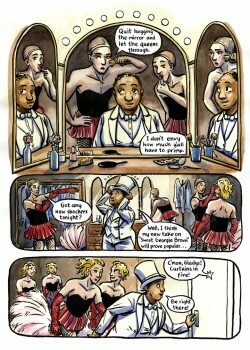 Funded by a Prism Comics Queer Press Grant, If This Be Sin is Hazel Newlevant's first fully-fleshed out work. 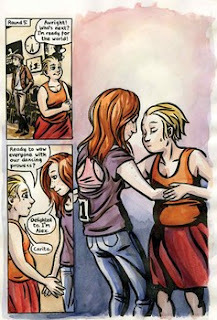 Each of the three stories in the collection connects queer identity with the arts, with the first two stories based on actual events and the latter containing similar emotional details. The book's formal qualities are interesting. Newlevant apparently uses a brush to draw her figures, giving them a denseness and solidity with a thick line that allows her to be relatively sparse when it comes to actual detail. Her use of watercolors runs with that initial density of line, as it allows her to pick and choose her color scheme to emphasize the book's emotional narrative as much as it does the chronological narrative. All of this is framed in a design that's unpredictable from page. Some pages have an open layout where one image bleeds into another to portray the passage of time (especially when music is being played), while others use a kind of floating grid where the gutters stretch and bend around panels. There are times when her figures are stiff and the body language isn't fluid, especially in how characters relate to each other in space. That hurts the emotional realism of the book at times, but Newlevant manages to get around that with many dramatically staged panels and a touch of magical realism that plays off of that stiffness. It greatly helps that Newlevant doesn't over-write here, adding redundant narration or overly expository dialog. She trusts the reader to figure things out on their own, especially as each story has painfully bittersweet qualities. The eponymous story is about blues singer/pianist Gladys Bentley, a cross-dressing, African-American, openly lesbian performer who was popular in gay speakeasies during the Harlem Renaissance of the 1920s. Newlevant here sees her earn a spot at a nightclub, boldly assert herself sexually and in terms of her talent, and sneer at the women at the church who looked down on her and literally spat in her direction. Newlevant adds a bit of drama with a police raid on the club that Bentley escapes and then cuts to an article she wrote years later about how she was "treated" to achieve a "normal" existence. Newlevant cleverly drops this narration first into an image of a distraught Bentley staring at a mirror after the bust, then into a page that finds this narration published years later in a magazine, and then brings us to later when she appeared on Groucho Marx's "You Bet Your Life" show. Bentley was portrayed as every bit the firecracker she was earlier as she fired back improvised lines at the legendarily quick-witted Groucho, but the final panel is a wistful look back at a top hat she sees in her dressing room. The top hat was emblematic of her drag outfit, a daring topper to her allowing herself to express herself as she saw herself. No matter how "normal" she had become thanks to societal and political pressure, Newlevant hints that she paid an enormous price to do so. The second story, "No it U Lover" is about Lisa Coleman and Wendy Melvoin, former members of Prince's band The Revolution. This story got a bit of buzz after Prince's death, and it portrays him as a complicated, ambitious musician with a lot of contradictions. The story details how Wendy and Lisa became key components of Prince's sound and look. For all of Prince's outrageousness on stage, he was a meticulously demanding taskmaster off of it, much like James Brown. At the same time, he was forward-thinking and knew talent when he heard it, like when he heard Wendy playing guitar in her girlfriend Lisa's dressing room. 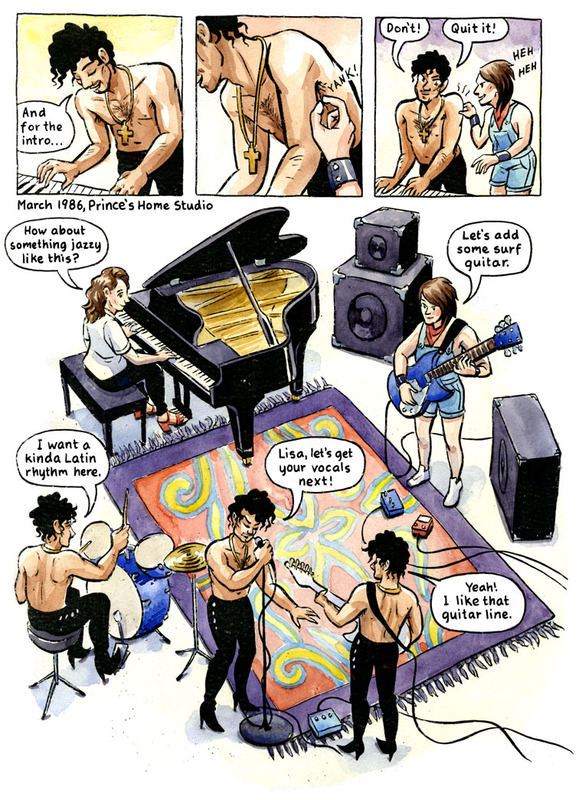 There's a panel where Wendy shows off and starts playing his songs and Newlevant draws Prince with his eyes lighting up, and we knew it wouldn't be long before she was in the band. 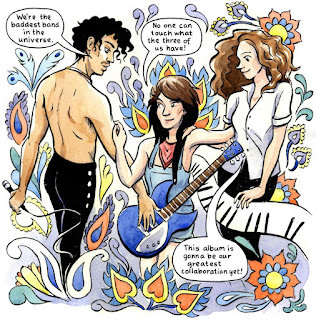 The sexually ambiguous Prince not only had no problem with Wendy and Lisa's relationship, he even played it up for events like creating a poster for Purple Rain, putting Lisa's arm around Wendy's waist. There's a bit of tension as they were trying to figure out just how public they should be, but in a beautiful two-page spread that's the emotional heart of the story, Wendy, Lisa and Prince become a sort of musical family, freely fusing their talents together. This is where Newlevant is at her best in shaking off the clumsiness in how she depicted her characters interacting with each other, as she Prince in three different poses in one panel to depict the passage of time, and then the three of them enter a "Dream Factory" space where they are all equals. That wouldn't last long, as Prince would want to go in a different direction and after a confrontation with him, he made it clear that he viewed this as his band--and moreover, that he had created them. Once again, the ending is a wistful one: Wendy and Lisa stand their ground but wind up being tossed aside, especially as they feel like they were exploited in a number of ways. Naturally, Newlevant uses a lot of purple in this story (including depicting their confrontation with Prince taking place on a rainy day), just like she used a lot of dark blue for Bentley's story (about a blues singer). The final story, "Dance The Blues" is a fictional one that takes place in modern times. It's about a blues dance competition where the main character, Carita, is nervous about how she'll do considering that it's her first time attempting this. She's wary of dancing with a preening egotist, and sure enough, when they are matched up, he tries to upstage her. When paired up with a beautiful woman named Alex, she's very much attracted to her in an unspoken way. When Carita asks her to hang out afterward, Alex reveals she's going home with Todd. The story doesn't have the emotional heft of the other two; it's simply a reminder of the ways in which gender, sexuality and identity are in a pressure cooker dominated by a culture that's defined as heteronormative and patriarchal. None of that is explicitly stated in this sweet, sad story, but it's the subtext of the entire book. Once again, her willingness to show restraint in expressing something she's clearly passionate about was remarkable, as Newlevant let the images and the colors tell the story.